Greg Sankey said Friday that he’s happy this has become a national conversation, and said it’s interesting that many fans have challenged his approach. Two days after National Signing Day, also the day Michigan coach Jim Harbaugh publicly revealed his plans to take his team to Florida during spring break for four practices, SEC commissioner Greg Sankey asked the NCAA Football Oversight Committee to quickly review Harbaugh’s spring plans. The Wolverines will travel Feb. 28 to IMG Academy, undeniably a recruiting hotbed, in Bradenton, to spend nearly the full week of the university’s designated spring break. Michigan will have four spring practices there, and Harbaugh has said they will have fun outings, such as trips to the beach. Harbaugh also said by holding practices during break, the players later will have two weeks without football so they can concentrate on final exams. Sankey last week was reported to have contacted the Oversight Committee on the grounds of student-athlete time demands. He was interviewed Friday morning on Sirius XM College Sports and was asked if anything but Michigan had triggered his response. Sankey said Friday on Sirius that he’s happy this has become a national conversation, and said it’s interesting that many fans have challenged his approach by saying, well, many other college teams, such as baseball, play during spring break. “That’s part of the regular season,” he said. Sankey also pointed out that the issue has become a recruiting-focused conversation. 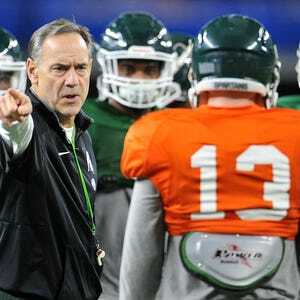 Michigan State coach Mark Dantonio, speaking Thursday night at an event in Grand Rapids, said practicing over spring break in Florida is something he is considering. “I think it’s creative, there’s no question about that,” Dantonio said. “From our standpoint, we’ve never thought to do that, but we’re thinking about it nowadays. 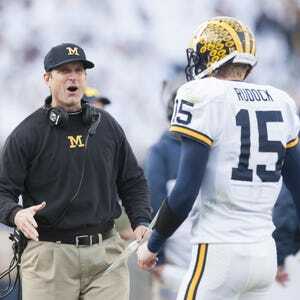 This is not the first time Harbaugh, in his second season as Michigan coach, stirred reaction from rival conferences. Several SEC and ACC conference coaches last summer expressed displeasure when he launched his multi-state “Swarm Tour” of satellite high school camps. The SEC and ACC only permit their coaches to work camps within in a 50-mile radius of their campuses. Sankey said Friday the satellite camp issue was one he pursued starting in 2012. “That had nothing to do with a particular program, just a concern of, wait, we have agreed to a recruiting structure,” he said. “… Are we going to allow the recruiting and the pressure on young people, the earlier recruiting, the bringing in boosters to practices to watch when you’re on these satellite camp tours? Is that what we really want to be doing in recruiting?